Like a lot of Seinfeld double episodes, “The Bottle Deposit” is a slightly windy caper, a shaggy-dog story that feels like a regular episode with a few too many extra scenes. This is especially true here, since apparently NBC decided to make this a double episode late in the game, which is why it clocks in at only 40 minutes instead of the typical 44. 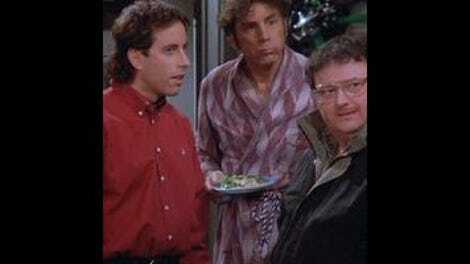 Unlike most double episodes, it doesn’t have a big guest star or an appearance by Jerry and/or George’s parents, although Newman does play a central role. It’s an altogether fun time with three plots that bump up against each other nicely (Jerry’s stolen car, Elaine’s stolen golf clubs and Kramer and Newman’s Michigan-bottle-deposit plot) and one completely separate George workplace plot that’s a more-extreme rehash of the “Pensky file” from season five’s “The Barber” (which was written by Andy Robin, who co-wrote this one). I really like the bottle-deposit scheme because we get to watch it develop, whereas usually we jump in halfway into a Kramer/Newman idea. Once Newman realizes you can get 10 cents for recycling a bottle in Michigan (which remains true), he turns right to Kramer, who shoots down all his ideas for making money because he’s already had them, crunched the numbers, and found you can’t make a profit. 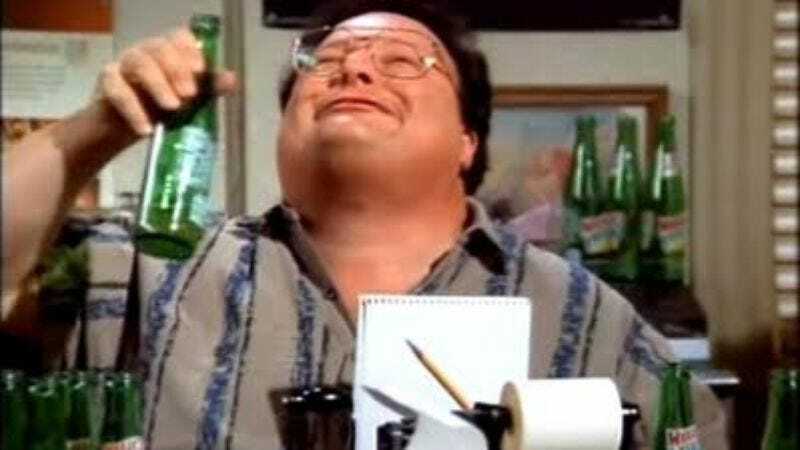 But in a show filled with obsessive people, Newman is a particular champion, and he eventually finds out a way to do it that breaks even more laws (it involves stealing a mail van). The way this lines up with Jerry’s car, which is stolen by jealous mechanic Tony (Brad Garrett), and Elaine’s JFK golf clubs, purchased at an auction for J. Peterman, is fairly ludicrous. But I actually like what it says about Kramer’s character. When it looks like he and Newman are going to collect a cool $500 each from their journey to Michigan, he spots Jerry’s car and realizes he has to choose between one friend and another, and it’s sweet how easy the decision seems to be for him. He won’t even try and find a way to do both—once Newman starts to complain, he kicks him out of the van and leaves him in rural Ohio, which is really an astonishingly mean (and very funny) thing to do. The subsequent farm/”keep your hands off my daughter” sojourn is a stupid one, but Wayne Knight is adept at physical comedy and a champion sweater, and he does a good job with both of those things there. Also, apparently all that running around convinced him to see a doctor and lose some weight. Good for him? Everything else in the episode is so-so. Elaine really has very little to do after she claims the clubs from the evil Sue Ellen (Brenda Strong, making a brief return appearance), mostly delivering updates on the plot to J. Peterman (“It seems that a psychotic mechanic has absconded with my friend’s car”). Jerry’s thing with Tony is a one-episode B-plot at best that gets way too much attention and gets turned into a spoof of homicide shows—in one scene Jerry visits a “murder” scene with a cop under a tarp, where one cop turns away to barf, and so on and so forth. It’s not unfunny, but it feels like a Saturday Night Live sketch more than anything. But even though George’s quest to discover what work his boss actually assigned him is seriously reminiscent of the Pensky file, it’s still pretty funny watching him squirm and takes a nice left turn when we realize that George’s boss (recurring character Mr. Wilhelm, played by Richard Herd) is actually losing his damn mind, rendering George’s quest for facts all the more pointless. It all explodes suddenly once Steinbrenner reads the report submitted by Wilhelm under George’s name. It’s a great example of Steinbrenner’s compassionately crazy streak—he won’t fire George, he just has him committed. “The Bottle Deposit” also marks the end of an incredibly loose trilogy spread out over season seven—the saga of George appearing to be insane to one woman, his old friend Deena (Mary Jo Keenen). He sees her one last time and all of her fears about him are confirmed, since he’s now belt-less and living in an asylum. Since she never appears again, we can be safe in the knowledge that she goes to her grave thinking George is bonkers. Like I said last week, it feels by this point that the writers are spinning their wheels till we get to the epic conclusion of season seven. Well, we’re almost there. I can feel the controversy! I kept waiting for the sight gag of Kramer and Newman putting their shopping in Jerry’s hood to come back around to their bottle deposit plot somehow, but it never did. Newman’s constant chugging of Mello Yello will make you want to never drink it again—not that I ever see it available in stores. Wilhelm’s reference to the song “Downtown” is weird and funny, but never gets resolved. I guess it’s just part of his nuttiness. Kramer whips out the show’s first cellphone in the car.